Baking soda is in nearly every household across the country. It's used to help freshen up musty rooms, clean up pots and pans, and even to help improve your oral health. 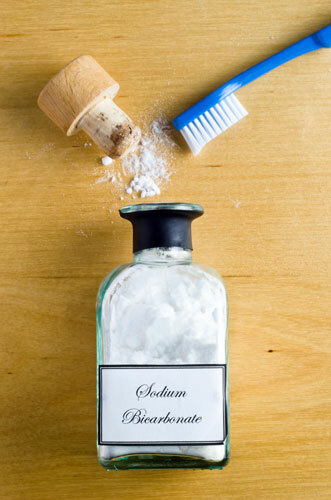 Using baking soda can help whiten your teeth, if you make sure to use it properly. It is only mildly abrasive, so it can be used safely on teeth for a period of time. If you want to use it to whiten your teeth, make sure to use it carefully and under the guidance of your dentist. The first step to making sure you are using baking soda carefully is to make sure it is safe for your teeth. Visit your dentist and make sure they are in healthy enough condition to be whitened. If your teeth are full of cavities, brushing off surface stains isn't going to do you any good. Next, you need to make sure you are using the right amount of baking soda. Most toothpastes now have baking soda in them. If you aren't using one with baking soda already, you may want to switch. This could be a really simple way of whitening your teeth doing something you are already doing - brushing! Finally, if that's not getting enough of the surface stains, try dipping the tip of your toothbrush and toothpaste into a little baking soda before brushing. Then, make sure you are brushing for the full two minutes. This allows your teeth to get the whitening benefits while you brush, without the worry of you using too much. You don't want to use extra baking soda long-term. Using baking soda toothpaste is fine, however. Just use caution and only use it if your dentist says it is safe. Using it with braces isn't safe, which is why you should contact our office first.